There is a lot of variation of tofu recipes. In fact you can almost make anything with tofu, from spicy tofu to soup or as an addition to other dishes. There is so much reason why Indonesian people like tofu. The first thing about tofu is they are very cheap. 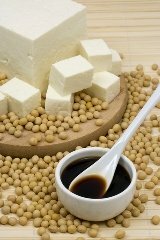 Second, tofu is very healthy because it made from soya milk. Third, you can use it as a substitute for meat if you are a vegetarian. Fourth, you can use tofu in many things you like, snacks, dessert, side dishes, and main dishes. And the last thing but not least, tofu is very suitable for the low calorie recipe. Tofu contains a large amount of iron and a little fat and so much fluid. If you let tofu stand for a while, the liquid would come out of the tofu. So if you’re on diet, maybe you can try tofu as a variation in your daily meal. In Indonesia we have different size of tofu and they have yellow and white color. The most common size is about 5x5x2 cm. You can buy it at the market or you can directly buy it from the factory itself. But there are also individual tofu seller from house to house, you can hear them yelling tofu in the afternoon. In Europe you can’t find this small and yellow tofu. The tofu that you can find at the Chinese supermarket is white and has different size than Indonesian tofu, it is bigger, about 10x5x5. And they are not salty, you have to pour some salt over the tofu before you bake or steam it. While tofus from Indonesia are salty and already well seasoned so you can even eat them raw. Have you maybe another inspired and surprising experience that you want to share about tofu? Just click here to tell your story. Some people find that tofu like a sponge to the taste. I agree with that. If you don’t use to it to eat tofu, you might don’t like it. But I can assure with the right ingredients and good Indonesian recipes, you might turn backs tofu in the excellent and delicious dish. I can talk about this because my husband doesn’t like tofu in the beginning. But he started to like this meal when I use this oriental recipe especially spicy tofu recipe. He likes it very much. So take a look of this delicious and many variation of tofu recipe. They are worth to try and maybe you get another opinion after you try these recipes. Learn how to cook healthy Chinese food with this cookbook. There are more than 500 oriental recipes with colorful pictures that easy to follow and you can prepare a table of whole delicious dishes in less than 45 minutes. And subcribe to the newsletter to get your free chinese delicious recipe. Click Here!